Abay Moncloa Residence is located in Madrid city center, close to Parque del Oeste and the Moncloa and Argüelles metro stations and the bus hub. It is in a lively district with numerous shops, bars and restaurants. Gran Vía, the Retiro Park, and the city's prominent museums are easily accessible from the Abay Moncloa Residence. The residence has a range of communal areas —television room, gym, outdoor patio, canteen and library—, all designed to promote an agreeable, multicultural, university and scholarly environment. UPM International Summer School participants should use the following code to qualify for special rates: #POL2019. Colegio Mayor Chaminade is one of the oldest residences on the Moncloa Campus. It is located right next to the Universidad Politécnica de Madrid Rectorate and is only one minute's walk from the Vicente Aleixandre metro (Spanish subway) station. During the summer, groups of Spanish and international students have for years spent time and relaxed together in the spacious swimming pool, cafeteria, fully equipped gym measuring 200 m2 and common rooms. Additionally, the residence is equipped with single rooms, homemade food, and there is Wi-Fi access throughout the building for work or pleasure. UPM International Summer School participants should use the following code to qualify for special rates: UPMISS19. Youniq Madrid is a new model of Student Residence built in 2017. It is located in the Moncloa Campus, a privileged place in Madrid. It is close to your studies, well connected and one step away from the Madrid City Center. Rooms are fully furnished and 80% of the rooms are individual, so you can enjoy both the amazing student community and your own privacy. It has a high-standard all inclusive service range, including food, laundry, cleaning, WiFi, gym facilities, an outdoor pool and lots of terraces, leisure rooms and study rooms. UPM International Summer School participants should use the following code to qualify for special rates: POL/19TEM. Colegio Mayor El Faro, opened in September 2016, is in the perfect location: Moncloa, where the Moncloa Campus meets Madrid city center. It is a brand new building with a total of 358 beds and the best facilities. El Faro is at an unbeatable location, only a stone’s throw from the main universities of Madrid. Living in the city center, you be anywhere in the city in a matter of minutes on foot or by public transport, as the Moncloa transport hub is less than 400m away. 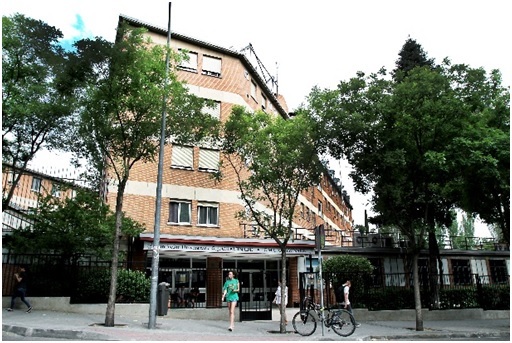 El Faro is the ideal accommodation for Universidad Politécnica de Madrid (UPM). El Faro is strongly committed to students and provides all the latest services, offering very high quality full-board student accommodation, including double rooms (for sharing) and singles (just for you) and private bathroom in every room, and common areas, including fully equipped gym, dining room with terrace and vending area, laundry service. There is high-speed Internet and WiFi throughout the building and individual climate control (air conditioning and heating) in all rooms. Copyright © 2019 International Summer School. All rights reserved.